The critically acclaimed WWII shooter is now available on Nintendo DS™ for the first time. Discover a completely redesigned game that fully takes advantage of the DS functionalities. 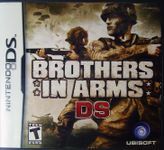 * Brothers In Arms® on DS for the first time: Game exclusively designed for the DS with easy-to-use, stylus-based controls such as the screen aiming system. * Impressive, realistic 3D graphics: Incredibly detailed environments, highly believable characters and enemies, cinematic camera angles, and great animation. * Drivable vehicles: Drive a 4x4 or a Sherman tank and use a wide range of weapons (bazooka, sniper rifle, grenades, and more) to destroy the enemy. * 16 missions and three different campaigns: Relive the intensity of WWII through three different campaigns, from North Africa to Normandy. * Redesigned new multiplayer experience: Fight major multiplayer battles with three of your friends with different multiplayer modes including Deathmatch and Team Deathmatch. * Contextual movements: Gameplay adapted to the DS hardware with auto-cover behind walls or auto-recovering life system. * An unrivaled sense of drama: Stronger emotional factor due to the third-person view and dialogue between the soldiers.